Like tech employers everywhere, Sabrina Parsons is scrambling to find employees from all walks of life who have the skills her company needs, in this case to build online software tools for small businesses. Her company, Palo Alto Software, is based in Eugene, OR, a small city about 100 miles south of Portland. The southern Willamette Valley area is home to two major universities—University of Oregon in Eugene, and Oregon State University in nearby Corvallis—and a growing tech industry that is benefitting from initiatives to improve local Internet connectivity, such as a direct fiber link to Amazon Web Services. Eugene housing prices have not rocketed up as high as in the major West Coast tech hubs. That’s made it easier to attract employees who may be giving up on overheated markets such as Seattle and the Bay Area, Parsons says. But it remains a challenge to fill certain roles, such as software-as-a-service developers, DevOps engineers, and user experience and interface designers, she says. To fill that hole, some in Oregon’s tech industry are adopting an apprenticeship model called Apprenti that was developed by the Washington Technology Industry Association’s Workforce Institute over the last two years. It began placing apprentices with companies such as Microsoft, Avvo, and Accenture in Washington earlier this year, and is now spreading to other markets including Michigan, Ohio, and California. The county workforce development program in Eugene and the Technology Association of Oregon (TAO) trade group are piloting the registered apprenticeship program, after winning a grant from the Oregon Bureau of Labor and Industries to cover the cost of training. People selected for the program learn the specific software programming languages and skills employers need through six to 20 weeks of training, typically through private coding schools that partner with Apprenti. Then they’re placed with a participating employer for a year of on-the-job training, where they are paid 60 to 70 percent of market rate for their position. For employers like Parsons—pictured above, at left, with Oregon Gov. 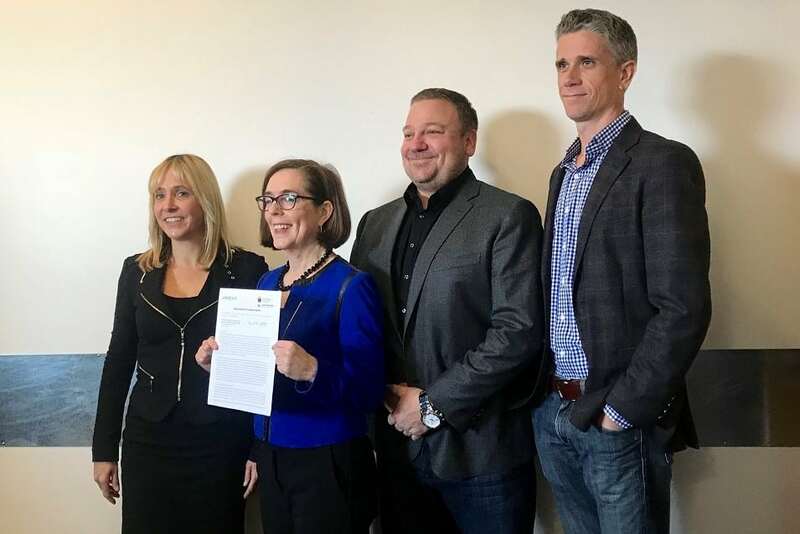 Kate Brown and other software company executives at an event announcing Apprenti—the program looks promising. “We’ve got somebody that hopefully is trained exactly how we want them and is more loyal to us because of this program that they’ve gone through,” she says. While Oregon universities and community colleges are also making efforts to meet the needs of the tech industry—which is poised to hire at least 800 people next year in central Oregon alone, according to a TAO survey—Parsons says they can’t adjust their curricula fast enough. Apprenti is designed to help companies like Palo Alto Software meet two other hiring goals: improving diversity and hiring locally. The apprenticeship program makes a special effort to reach out to women, veterans, and people of color—groups that are under-represented in tech. Of the nearly 60 people who’ve applied to Apprenti in Oregon during the last three weeks, about 22 are women, and 30 are part of a minority group, Parsons says. The women applicants include a wide range of ages, she adds. “There’s young women but there’s also older women who have been maybe out of the workforce for some time, took some time off to have kids, want to get back into the workforce, and are college educated, but don’t have tech skills,” says Parsons, who writes a blog called Mommy CEO. Parsons hopes that training local people for careers in the tech industry could help the its reputation, countering some antipathy toward it she’s noticed in Eugene.